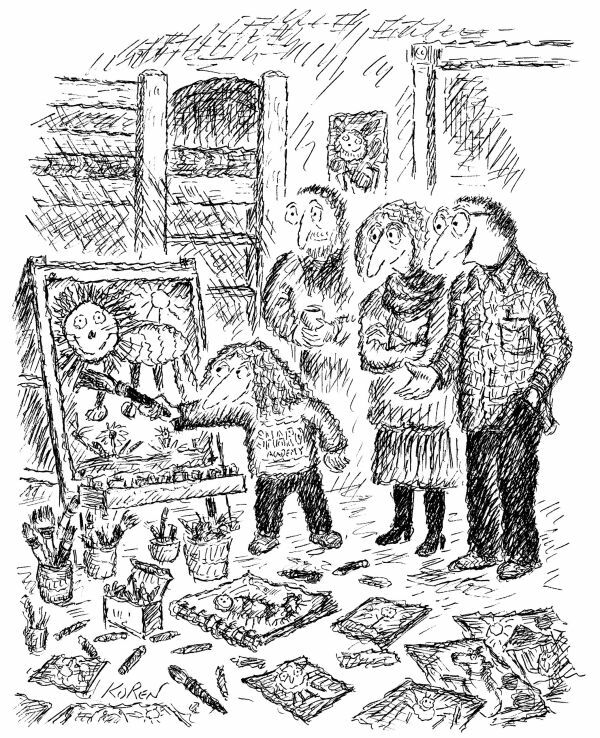 As their young child paints just another picture of a cat, her parents deploy the language of the moment to express their ambition for their budding artist (Koren, New Yorker, 23 Feb, 2015). Arts education is facing, sometimes embracing and increasingly initiating enormous change at a time when the relevance of universities as part of mass education is being debated around the world and as the notion of work (and what will be left of it after intensive roboticisation in nearly every industry and workplace by 2030) needs radical reassessment and planning to do battle with ever increasing social and economic inequality. Many in the arts feel uncomfortable about being reduced to players in the ‘creative economy,’ instead distinguishing between themselves as free-agent artists and those in the ‘creative industries’ whose interests appear to be strictly market-place driven. The difference is, of course, not absolute. Only a small number of arts graduates will become artists while many will practice their art in a modified fashion in health, education, hospitality and, yes, the creative industries. In many countries around the world there is increasing investment in the creative economy (both arts and creative industries), especially in Asia. In the UK a significant report has recently been published: “The Creative Economy and the Future of Employment: Why the UK needs 1 million new creative jobs by 2030 and what the Government can do about it,” by Hasan Bakhshi and George Windsor (Nesta, 2015). The like-minded Warwick Commission report, Enriching Britain (Warwick University), sees the cultural and creative industries sectors as one ecosystem and the UK’s Creative Industries Federation argues for including “cultural education” in that system: “It is time for the UK’s creative community to take control of its own destiny. There is an urgent need for the sector to speak with a strong, independent voice, bringing together the UK’s public arts, creative industries and cultural education”. Meanwhile, federal Australian Government arts funding changes will diminish the role of innovation and experimentation in the arts, there is no uniform policy for the creative industries and the arts in the tertiary education sector are vulnerable to further government cuts. For this year’s Arts Education feature we’ve departed from our usual surveys of the workings of tertiary education arts faculties, schools and departments to focus on specific examples of some fascinating developments. An exception is our coverage of the making of filmmakers where we’ve spoken with teachers in three schools, but even there our focus is solely on the education of the documentarian in a rapidly changing digitalised ‘factual’ industry, one with clear connections to the creative industries. Sarah Miller reports on a recent major tertiary education performing arts festival in Singapore that offered students an opportunity to see themselves in an Asian context rich in training methodologies and performance types. Joe Felber at Adelaide’s College of the Arts describes the education of young photographers as the practice diversifies. PICA Education Officer Melissa McGrath and Head of Arts Learning Area Stephen Armitstead at Warnbro Community High School south of Perth tell us about the development of an innovative school-gallery relationship aimed to develop independence and innovation in students and which came out of a research study at Edith Cowan University. Stephen Whittington at the University of Adelaide directly addresses musical creativity and career prospects in the arts and the creative industries and Paul Thomas at UNSW Art & Design takes us through an intensive course in experimental thinking. It’s the kind of thinking much needed as we face enormous challenges of all kinds in and beyond arts education. My thanks to Henry Boston for pointing me to the Nesta and Warwick Commission reports. We’ll have more on these soon. See also, Julianne Schultz, Where To From Here (SMH 13th Aug 2013).